Interested organizations and teams can participate in the call until the 15th of July. IRSUS will offer a complete catalogue of free services to all the actors of the innovation ecosystem included by the European Commission in the Innovation Radar. The goal is to successfully reach the market with their products and services contributing to the competitiveness of Europe. IRSUS has launched the first call for innovative companies and entrepreneurs from all over Europe in the frame of the project. This opportunity is focused on those included in the Innovation Radar of the European Commission, and who want to go one step further to launch or consolidate their products and services in the market. IRSUS wants to solve the gap that exists between innovators (research teams, SMEs, spin-offs and start-ups) and the market, supporting the creation of viable and attractive business models, as well as strategies focused on users and consumers, customers, partners and investors. The selected organizations will be able to receive and choose from a wide range of support and coaching services to turn their activity into a success. The call to opt for these services will remain open until the 15th of July. 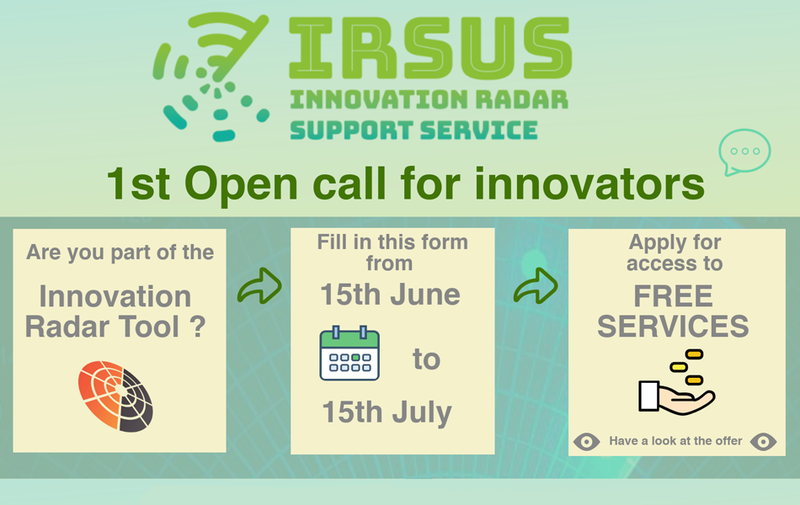 The call for IRSUS is aimed at any SME, start-up, research centre or University that is included in the Innovation Radar of the European Commission. To participate it is necessary to fill out a simple form before the 15th of July. The questionnaire is about the innovations developed by these organizations with the support of European funds. The received proposals will be evaluated and in the month of August the selected ones will be announced. During 2018 these organizations will be able to access on-line training on financing models, business plans, available funds, etc. 20 of them will also receive the preparation of the road map for its technological commercialization, exclusive sessions with mentors in different themes, maps of financing opportunities by ZABALA and support for crowdfunding campaigns. On the other hand, they will be able to receive specialized advice to participate in the European calls for SME Instrument and Fast Track to Innovation, office spaces on demand in Madrid, Milan, Paris, London or Düsseldorf. Other advantages will be travel bags to attend the most relevant events in Europe, inclusion in the portfolio of IRSUS companies aimed at investors and Business Angels, discounts at Amazon Web Services, etc. They will also be able to present their project in the demonstration space of etVenture in Berlin, the epicentre of the start-up universe in Europe. In 2019, the selected companies will participate in workshops, demo days and other services of interest. For the latest news on the IRSUS Open Call, follow us on our social media channels: Twitter, LinkedIn or Facebook!